A journey of discovery for our three anglers this week with multiple mid thirties and a three figure catfish! This week we had the pleasure of welcoming Rob and his dad Bob and friend Ben who’d been looking forward to their session for two years! Needless to say they were very happy to finally be here and walk the banks they’d dreamed of fishing for so long. Although Rob and his dad had fished in France and Spain before, for Ben this was going to be a journey into the unknown as this would pretty much be his first ever fishing trip… wow, that’s brave! They’d already planned to fish as a team and Rob would be looking after all rig and hook maintenance so Ben was in safe hands. Tour done, we left the guys to settle in and formulate the plan of attack. 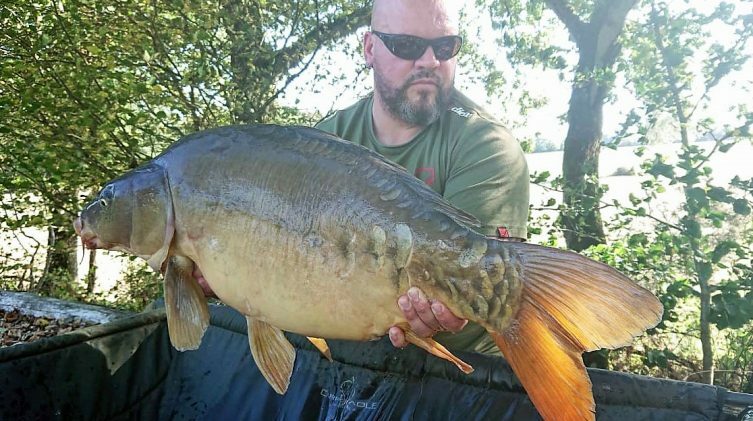 Rob and Bob are experienced carpers that love their fishing and are used to catching everywhere they go, even when those around them are blanking. They’d done the prep work before arriving and were willing to put the effort in. In order to be able to enjoy their time together and fish as a team, the guys decided to start the week in the Point swims. 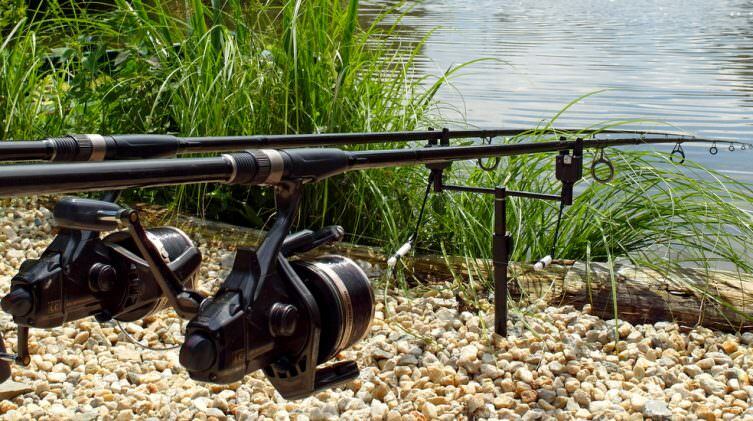 Rob’s main target was the cats so they spread the rods out to target the cats in open water and the carp in the margins. 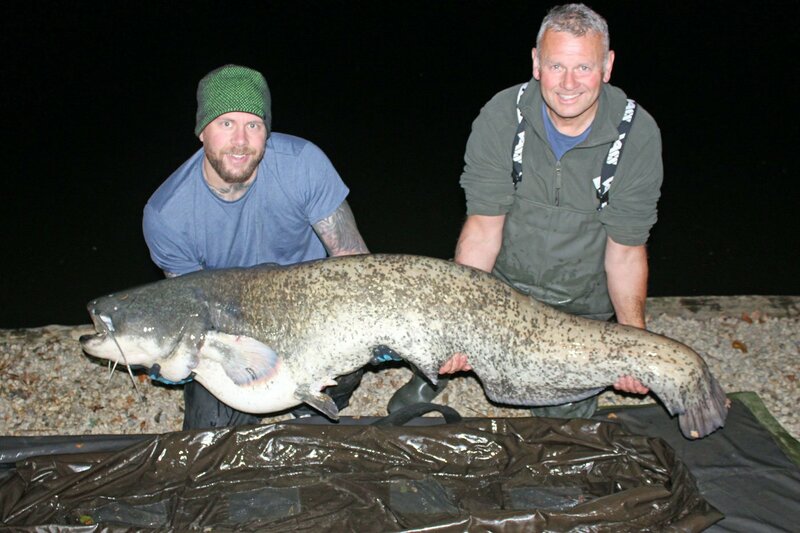 With their tactics in place, the first bites happened quickly and by Monday, they had banked two fish: little Sammy and Rob’s first cat at 62lbs. Rob had done a very good job on his hook sharpening and getting things right on the rig front but one small detail was causing the lead to act like a traditional semi fixed rig and that’s enough to make all the difference in the world. It was a simple tweak to the rig mechanics and after a chat about location and baiting strategy, I rowed one out for them. Later that day, while Bob and Ben were off to the shops, that rod ripped into life and Rob banked the heavily scaled Duchess. That sent a wave of confidence through the camp and the guys re-doubled their efforts on all fronts. By Wednesday, a couple more fish had been banked but the guys were starting to rack their brains on how to increase their chances. One thing to bear in mind is that Beausoleil is not your normal flat bowl type venue. It’s got more ups and downs than you can shake a stick at and getting your line lay right to certain spots can be the difference between catching and blanking. If you are on fish but you can’t get a pickup even when the rigs and hooks are perfect, a simple change of swim can be all that’s required. The guys latched on to the idea and quickly decided it was worth moving. Very hard water to fish right but our fishing has improved massively as a result. Welcome was great, service was great all week. Attention to detail is outstanding. With the whole group relocated to the Big Double and Island point swims, it gave them a whole new perspective on things. We joked that it’s almost like fishing another lake, 2 for the price of 1! Thanks to the very low levels of light pollution, the nights can be spectacular here and while gazing at the heavens, the boys were treated to a shooting star that night that momentarily flashed into life. Rob had dreamed of banking a Beausoleil monster catfish for a very long time and this was the perfect opportunity to make a wish … You never know, it might come true…. Just a few hours later, one of Rob’s rods tightened up and he lifted into what he described as a slow moving bus… Strange, we didn’t notice any buses when we netted last! The take had everyone’s full attention and the guys were eager for an indication of size. Not wishing to tempt fate, Rob played it cool and offered few details but he knew from the manner in which it held station that this was a good fish. There’s not a whole lot you can do in these situations apart from continuing to apply steady pressure (up to the limit of your gear) and be patient. In his job it’s essential that Rob remains cool under pressure and this he did. Continued application of massive amounts of pressure finally coaxed the creature into life, and it powered round in open water for some time going on a seemingly endless series of powerful runs. Rob is a very fit, big strong man but it still took him an arm aching 45 minutes to coax the beast to the bank. At first his dad had a go at scooping him up with our catfish weigh sling but things didn’t go according to plan. There was no way that this cat was getting away so Rob passed the rod to Ben and with one hand in each side of the mouth he hauled the creature up on the mat with every ounce of strength he had…. 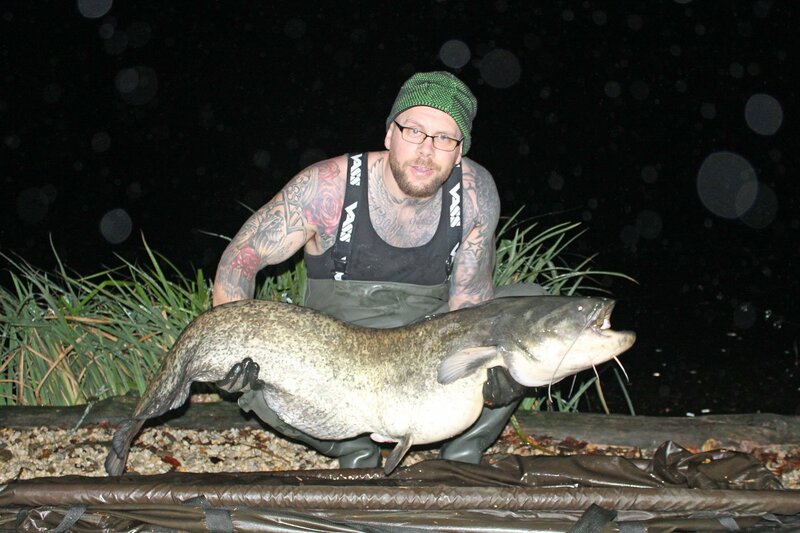 It was easy to tell from the massive head and near 6ft length that this was an absolute beast of a catfish…. a dream capture in fact, and granted by a star! At 105lbs it was far more than he’d actually wished for and it made the cat fishing he’d done on the Ebro seem very tame in comparison. Ben’s got a new hobby! This was a bit of a discovery trip for Ben who had done very little fishing before. With a totally open mind and a lot of help from Rob on the rig and setup front, day by day Ben realised just how much goes on into a week’s fishing session. “I thought I was going to be bored!”, not a chance, as Ben soon understood how much preparation and thought goes into the fishing. 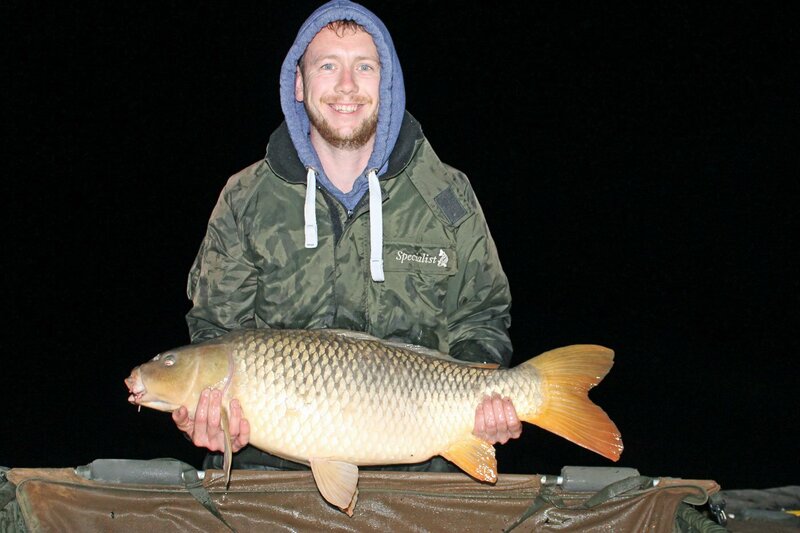 Ben had three takes on his rods for the week and banked a new PB carp of 25lbs. Unfortunately, he barely had the time to enjoy his first Beausoleil carp … Rob’s rod went while he was posing for the photo and it was all hands on deck as Rob was battling his big catfish. Hopefully, next time, you get to enjoy your moment a bit longer! Ben also banked a small catfish which even at 15lbs was a totally new experience! He also lost a big cat, which at first be mistook for a rock, as even under full pressure it didn’t budge. The rod was positioned some 8m away from the bridge and when the rock morphed into a massive catfish and headed towards it, there was nothing Ben could do but hold on for grim death! It wasn’t long before the pressure exceeded the strength of Ben’s hand sharpened hook and it simply folded open. It was his first attempt at hook sharpening and it’s easy to overdo it at first. Ben was blown away by the power of these creatures and chalked that one down to lack of experience. It was a tough week’s fishing weather wise with clear skies and the air pressure in excess of 1030 mb some days. It was a week where you have to make smart decisions to keep the takes coming. It wasn’t a week where big hits of fish were coming from a few spots, it was more a case of fishing for a handful of takes from a variety of spots. Rob started off with his favourite method of spreading large beds of boilies but in the end small traps or multi traps were the best method. It was just a question of putting them in the right place at the right time from the right angle…. easy really….. not! On their last night, Rob decided to go all in for another catfish and run the risk of blowing their chances with the carp. Unfortunately it didn’t happen on that last night but it was worth it as the buzz from banking a massive catfish meant so much to him. 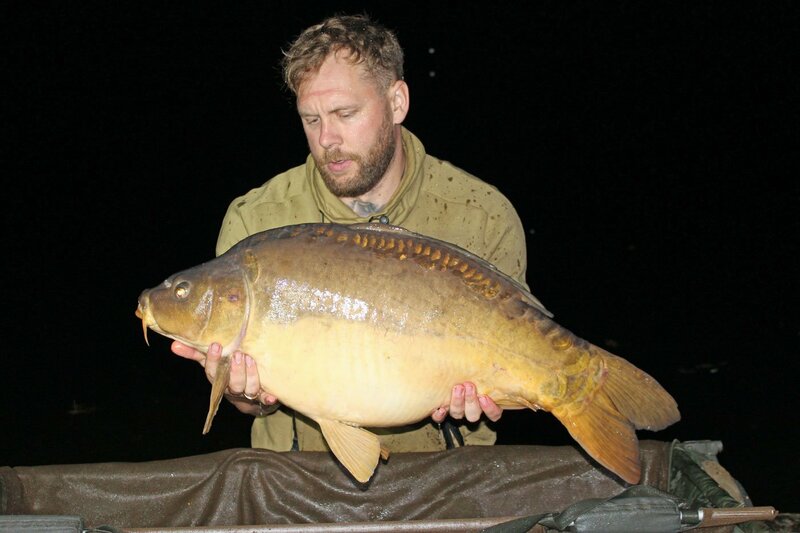 With multiple mid thirties and a mammoth catfish it was very much a case of job done for Rob. Dad also got in on the action when he banked Big Sammy at 24lbs 8oz. The guys were really pleased with their results. 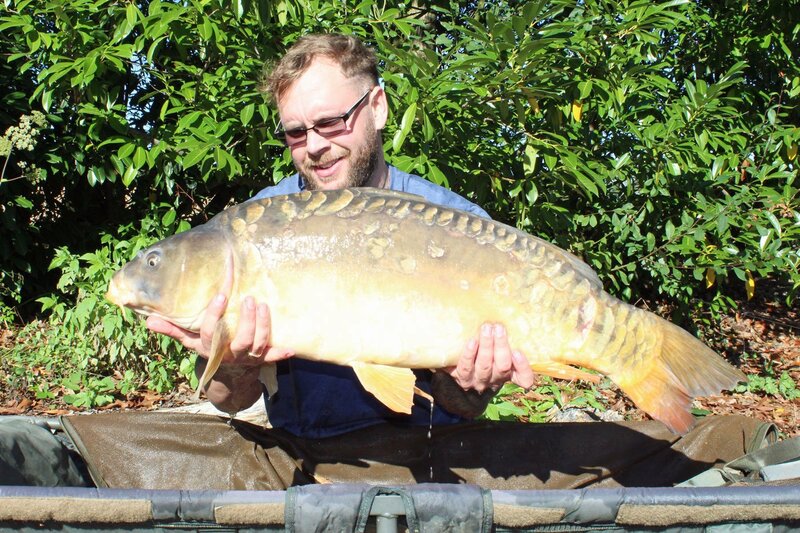 They fished really well as a team and banked some cracking specimens. 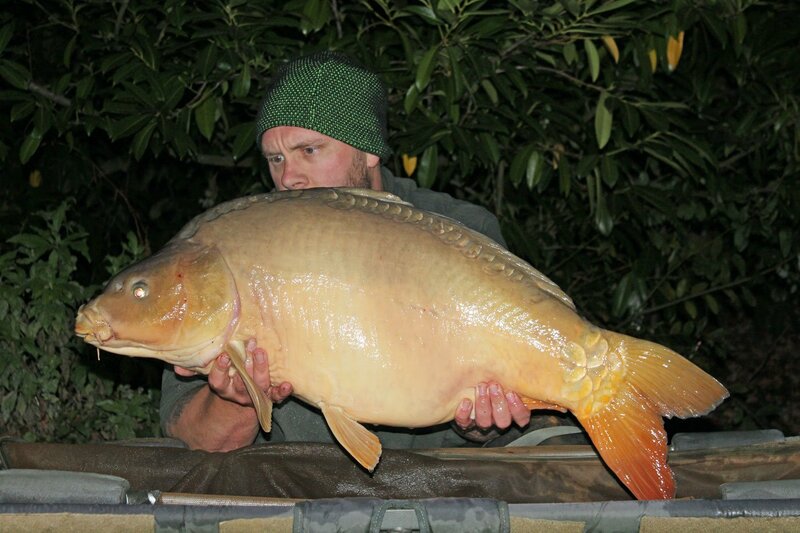 Beausoleil is a highly technical venue with some very wily and powerful specimens and even for the well travelled angler it can be a bit of a head scratcher at times. Rob told me that he’d learnt more from this one session than he’d done during all his previous trips which is wonderful for us to hear. It was an absolute pleasure to meet them and it’s great to know they’d love to return for another crack at this unique water. Double Shrimp & Crayfish, open water spots baited with small traps during the day and big traps at night. The bait boat was sometimes unavailable as the spare batteries supplied were dead. Working spare batteries to make the most of the €100 cost would be good but really this is a tiny detail. Yes, but with a day’s tuition from Matt. For the first time, we had a great week. Welcome was great, service was great all week. Attention to detail is outstanding. Very hard water to fish right but our fishing has improved massively as a result. Effort paid off with good catches and great rewards each night. Thanks guys... we will be back!